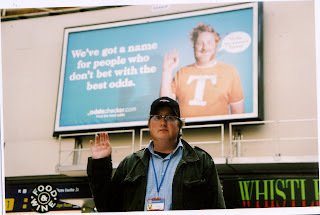 Hello everyone, meet Trevor, our not so clever bettor who fronted our Oddschecker campaign last autumn. His real name is Thorsten and he was a grad student discovered in a street casting session in Germany. As a treat (of sorts) his girlfriend brought him to London so he could witness his image on the huge poster sites, and here he stands at Waterloo in front of his celebrated alter ego.